10 Best Places to Visit in Guangzhou, China- In this world a lot of interesting places that you can visit while on vacation. One of the destination countries you can visit is China because, in this bamboo curtain country, there are many cool places that deserve to be a tourist destination. Guangzhou is the largest area in southern China. The city has beautiful and interesting places suitable for photographs. Of the many tourist attractions in Guangzhou, here are 10 recommendations of the top attractions in Guangzhou that must be visited. Canton Tower or Canton Tower was formerly known as the Tower of Guangzhou TV & Sightseeing or TV Tower. The tower is located close to Chigang Pagoda area, Haizhu District. The opening of this tower was conducted on September 29, 2010, for the 2010 Asian Games event when Guangzhou hosted it. Until now, this tower still earned the title as one of the tallest buildings in China. Formerly this tower had become the world's tallest tower for a year by shifting the position of CN Tower (553 m) in the city of Toronto, Ontario, Canada. Today, the world's tallest tower is occupied by the Tokyo Tower in Japan. One of the interesting things about this tourist attraction in Guangzhou is the model of the building is interesting and exotic. The tower has a unique outdoor design, while from inside the tower, visitors can see the beautiful scenery of Guangzhou city. Temple of Six Banyan Trees is one of the temples in Guangzhou. This Buddhist temple was built in 537 BC during the Liang dynasty. Initially, this temple was named Baozhuangyan temple, but then famous poet named Shi Su called it "Liu Rong" (Six Banyan Trees). The mention is because at that time he saw six banyan trees around the building. Apart from being a place of worship, this temple also presents another charm. In spring or around April, the temple holds the Chinese Spring Festival and Lantern Festival. When this activity takes place, many Buddhists, and tourists who come to visit this tourist attraction in Guangzhou. Guangzhou Opera House is a large and beautiful theater building. The beauty of the building was inaugurated in May 2010 is not separated from the role of architect Zaha Hadid who came from Iraq. She is the first woman to win the Pritzker Architecture Prize. The building being built facing the Pearl River takes five years to complete. The structure of the building in Guangzhou consists of granite and glass steel frame. The interior of this building is also amazing and has an asymmetrical auditorium. Somewhat unusual indeed, but the artistic atmosphere fits as a dramatic opera watching spot. As the name implies, this building was established to commemorate Sun Yat Sen, a Chinese revolutionary as well as China's first president. The building is located on the southern slope of Yuexiu Hill. Historically, this memorial building was designed by Lu Yanzhi. In 1929, this building began to be built with a fund of $ 500,000 and completed in 1931. This building style is a typical Chinese style, which is octagonal. If you are a tourist history buff, this tourist attraction in Guangzhou is the right place for you to visit. Today, Sun Yat Sen Memorial Hall is used as an important meeting place, theater venue, and concert venue. This building can accommodate visitors up to more than 3000 people. Lotus hill is one of the hills located near the Pearl River, on the eastern outskirts of Panyu town. The name Lotus Hill is derived from a fairy tale that tells of an evil dragon in the South China Sea. This dragon often makes waves in the Pearl River. As a result of the dragon's actions, the ships became overthrown and the agricultural land was flooded. This calamity began to stop when the Goddess of Mercy saw the suffering experienced by the people. To tame the dragon, the Goddess of Mercy through the lotus into the water and sat on it so that the dragon was successfully tamed. The lotus stone that lies next to Nantianmen Hill is believed to be the lotus thrown by the Goddess. Shamian Island or Shamian Island is one of the attractions in Guangzhou that you must visit. This place was once a place to withstand attacks during the second Opium War. An island is a convenient place for pedestrians because it is dominated by pedestrian paths. This place you can walk on foot because the area is not large, less than 1 sq. Km. At the edge of this island, many overgrown trees so the atmosphere is beautiful and cool. In addition, this one tourist spot you can enter for free. South China Botanical Garden is a botanical garden located in Guangzhou. This garden is also one of the oldest botanical gardens since it was built since 1929. In addition to being the oldest, this garden is also the largest in China with an area of about 741 hectares. The garden is generally divided into three main zones: nursery and exhibition zones, research and residential zones, and nature reserves. In addition to these three zones, you can also visit other spots that become the favorite places for the tourists. Tourist attractions in Guangzhou are suitable for you who have small children because here they can learn a lot about the world of plants. 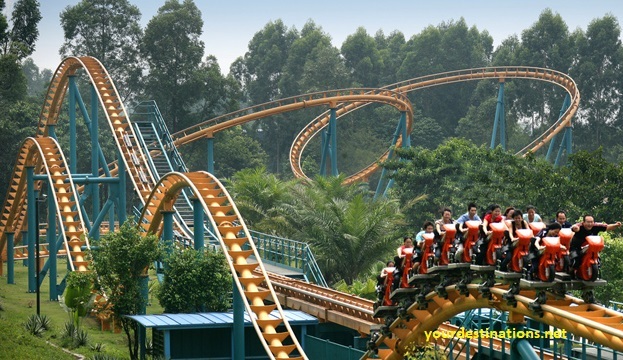 Chimelong Paradise is a provider of game rides that have been open since mid-2006. Inside is available a variety of rides games and modern attractions. The number of rides in a Chimelong game is quite a lot, which is about 60 types of rides. Some of the rides of the game have ever won an international class award as the best rides. One of the rides of the game is the Inversion Roller Coaster. These rides have a trajectory of 850 meters and consists of ten ring circles. With these rides, visitors will enjoy the sensation of spinning like when in the vortex. Reportedly, this has made these rides recorded into the Guinness Book Record. The area also provides a zone for children named Happy Amusement Park. This zone is designed by adopting the design of a fairy tale. In it, has been provided various types of rides that will certainly make the kids happy to play with his family. In addition to the rides game, acrobatic attractions are also presented along the Chimelong Paradise amusement park that is sure to captivate your heart. Guangzhou Ocean World functioned as one of the center of education and scientific research for various marine biota. The place built in 1988 is one of the most popular sights in Guangzhou. Architecturally viewed, this building is very interesting because it is a tunnel and a large aquarium. At this tourist spot, you will find many exhibition halls equipped with sophisticated high-tech systems and equipped with interesting attractions from a variety of marine life. Well, that's the list of attractions in Guangzhou that must be visited the version of Yourdestinations.net. Which tourist attractions will you visit? Share Please!